It's been cold today. The Mistral has been pushing iced air down from Scandinavia and funnelling it through the narrow neck of the northern Rhône, whipping it up to dizzying speeds. An empty wine vat was found in the middle of the road in Châteauneuf yesterday, dumped there by a particularly vigorous gust. A visit to the ruined castle in Châteauneuf last afternoon was quickly aborted. The restaurant just under the peak on the hill was shut and, with difficulty, we staggered up to the car park summit. A sudden gust blew both our glasses clean off our faces and we had to run back down hill to retrieve them, mine irreparably chipped. We heard today that yesterday's winds were gusting at up to 140 km/h. We walked around Orange market early this morning and watched North African and local traders laying out their stalls. Huge dishes of hot food were being stirred over burners; barrows selling honey and sausages attracted the attention of those strolling past (alas, we had just had breakfast); aromas of garlic and savoury meat rifled past on the wind. Then we headed back to Châteauneuf for a tasting at Pégau. Laurence was somewhat under the weather, having broken her hand in a car crash in Montpelier during Vinisud. We assisted with fetching and carrying, however, sidestepping numerous small dogs, and we enjoyed a wide-ranging tasting that included the '06s, an '05 or two and various cuvées of '07 drawn from the giant foudres lined up in Pégau's cellars, as well as huge cement vats upstairs. Both '06 and '07 are vintages that very much suit the house style here, the purity complimenting the naturally sauvage nature of the wine. They are rich and meaty and exciting. Head for Le Pistou if you're in Châteauneuf and are feeling pangs of hunger. The quality:price ratio of the filling local dishes is excellent and they offer a short but well chosen list of wines. I ate confit de canard, more shame on me. The afternoon brought an opportunity to visit Domaine Barroche, where we met up with Julien Barrot, the latest generation of the family to take up the reins as wine maker. Prior to Julien joining the business, his father had sold all their wine in bulk, but as is so often the case, Julien looked at their vineyard holdings - 12 hectares, including a sizeable tranche of centenarian Grenache vines - and couldn't resist bottling the wines under a family label. Julien's been at it for a mere 5 years, but has already attracted praise from lofty commentators. Robert Parker tasted the 2005 of Julien's Pure cuvée recently and was moved to give it a perfect 100/100 score. This was a monumental visit. We started with a tour of the vineyards, offering ourselves up to the Mistral that was ripping across the slopes. 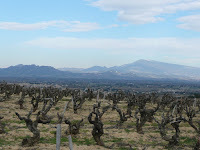 The light was crystal clear and Mont Ventoux reared in the distance looking like Mount Fuji. 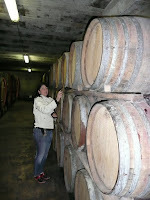 Then it was back to the domaine where we started tasting. Julien's pride in what he does is evident. He understands a great deal about the vineyards and wine of Châteauneuf-du-Pape and is eager to expand his understanding yet further. We tasted perhaps 20 wines and it quickly became clear that we were going to be late for our next appointment. No problem, Julien told us. He would 'phone ahead. Once again, we learned that our next hosts had completely forgotten that we were coming. When next we come to the region, I am determined to travel with a briefcase full of diaries that I will give away freely. We finished at Barroche with a tasting of late picked, sweet Clairette. Julien makes 400 bottles of this wine and keeps it all for himself and his family. We could see why. Like his other wines, it was utterly delicious.